The electromagnetic display of the Northern Lights inspired this wind spinner. Turquoise glass spheres surround the golden center. Blue and green metallic spheres are suspended on curved steel arms that capture the wind and reflect light, creating a blend of dancing hues. Ball bearing construction allows each side to spin in the slightest breeze and rotate around the sturdy powder coated pole. Two sided spinner measures 24" in diameter and stands 63" tall plus a 12" four pronged stake to secure to the ground. Some assembly required. Instructions included. *Sorry, gift wrapping not available for Aurora Borealis Wind Spinner. Our dazzling wind spinner will be the envy of your neighborhood. The outer spinning petals of metallic blue and purple frame the interior flower design of pink and blue glass petals. The acrylic crackle ball in the center features a solar color changing LED that automatically illuminates at dusk. Light cascades through red and blue lights creating a complement of colors for a beautiful garden accent. 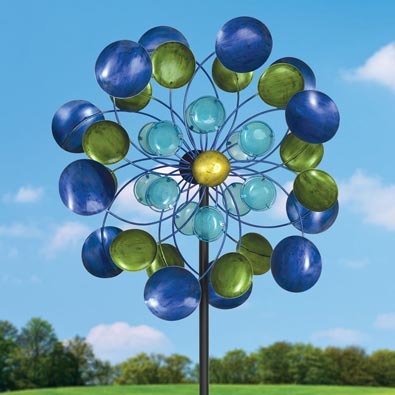 The floral design measures 14" in diameter and stands 44" tall on a sturdy powder coated pole with an 8" three pronged stake. The solar panel contains 1 AAA Ni-CD rechargeable battery and on/off switch. Some minor assembly required. *Sorry, gift wrapping not available for Solar Watercolor Wind Spinner.